Zou et al. reveal the underlying mechanism that regulates the ontogeny of plant innate immunity. Plant Cell https://doi.org/10.1105/tpc.18.00297. Background: Plants and animals largely rely on innate immunity to protect themselves from pathogen infections. Recognition of pathogen-associated molecular patterns (PAMPs) by plant pattern recognition receptors (PRRs) initiates PAMP-triggered immunity in plants. FLAGELLIN-SENSING2 (FLS2) is a well-known PRR that recognizes bacterial flagellin. Immunity varies with age. The human immune system in early life undergoes rapid, radical changes and displays large differences from that of adults. As in humans, age-dependent immune responses have also been observed in plants. However, little is known about the ontogeny of plant innate immunity during seedling development. Question: We wanted to know whether FLS2-mediated immunity involves an ontogenetic process. If so, what are the mechanisms that regulate the ontogeny of plant innate immunity. Findings: We found that FLS2-mediated immunity during seedling development involves an ontogenetic process. The transcription of FLS2 controls the ontogeny of FLS2-mediated immunity. 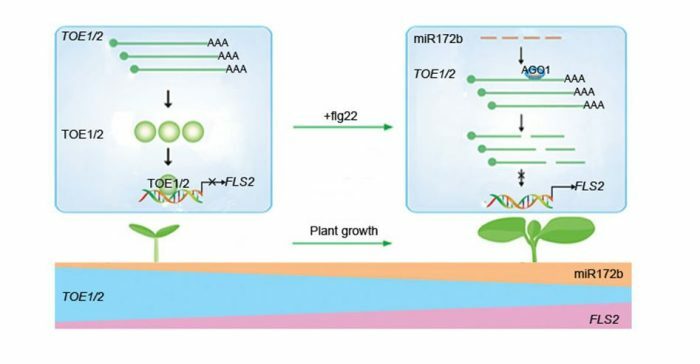 Importantly, the Arabidopsis thaliana microRNA miR172b regulates the transcription of FLS2 through TARGET OF EAT1 (TOE1) and TOE2, two targets of miR172b. These two transcription factors (TOE1 and TOE2) directly bind to the FLS2 promoter and inhibit its activity. The level of miR172b is low in the very early stage of seedling development. Consequently, the TOE1/2 protein levels are high in the same stage. Furthermore, miR172b abundance increases during seedling development, while the TOE1/2 protein levels decrease with time, which results in increased FLS2 transcription and the ontogeny of FLS2-mediated immunity. Next steps: We show that miR172b regulates the transcription of FLS2 through TOE1 and TOE2, which governs the ontogeny of plant innate immunity. This finding prompts us to investigate additional mechanisms and components that regulate the ontogeny of plant innate immunity. Yanmin Zou, Shuangfeng Wang, Yuanyuan Zhou, Jiaojiao Bai, Guozhong Huang, Xiaotong Liu, Yingying Zhang, Dingzhong Tang, Dongping Lu. (2018). Transcriptional regulation of the immune receptor FLS2 controls the ontogeny of plant innate immunity. Plant Cell DOI: https://doi.org/10.1105/tpc.18.00297.